The SYSTEM-8 delivers a vast palette of sounds inspired by over four decades of legendary Roland synths. Its next-gen Analog Circuit Behavior (ACB) engine powers an eight-voice, three-oscillator monster with stunning filters and effects, highly versatile LFOs, and a massive array of high-resolution knobs and sliders to control it all. 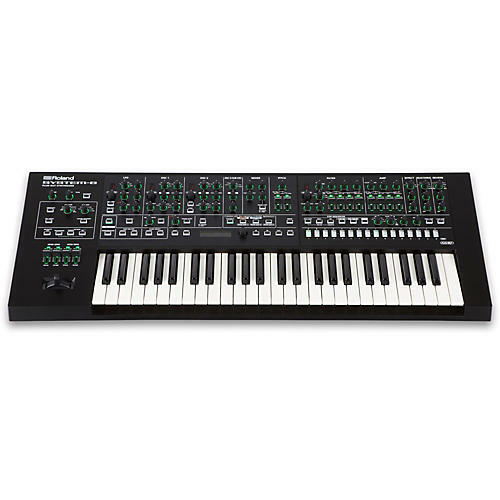 Support for three PLUG-OUT synths means the SYSTEM-8 can host recreations of numerous Roland classics, with JUNO-106 and JUPITER-8 included at purchase. Split and layer synths for unheard of sounds, and tap into the integrated vocoder, arpeggiator, CV/Gate outs, and advanced polyphonic step sequencer to fuel endless creative explorations. Roland’s acclaimed Analog Circuit Behavior approach recreates historic analog sounds with forward-thinking technology. The SYSTEM-8 is equipped with the most advanced ACB engine yet, which offers eight voices of polyphony, three oscillators (including a sub oscillator option), and silky-smooth filters with ultra-detailed resolution. It’s easy to dial up warm pads, fat basses, expressive lead tones, and more, all inspired by the rich sonic character of the legendary SYSTEM series. Reaching beyond the retro vibe, the versatile SYSTEM-8 is also capable of producing crisp, dynamic tones and textures that are ideal for modern sound designers. ￼In addition to its impressive internal sound engine, the SYSTEM-8 features three expansion slots for hosting and controlling Roland’s PLUG-OUT software synths. JUPITER-8 and JUNO-106 PLUG-OUTs are included, giving you immediate access to authentic sonic reproductions of these Roland classics. Optional PLUG-OUTs such as the SH-2, SH-101, PROMARS, and others are supported as well. Using the SYSTEM-8’s Performance mode, you can combine the internal synth engine and hosted PLUG-OUTs to create super-synth patches with layered voices, custom splits, and more. Line input: L/R ¼ in.